Definition at line 38 of file itkMetaImageIO.h. Type for the list of strings to be used for extensions. Definition at line 338 of file itkImageIOBase.h. 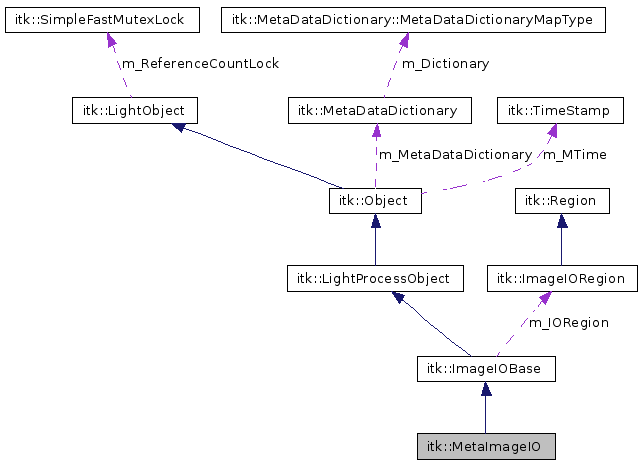 Reimplemented in itk::ImageClassifierBase< TInputImage, TClassifiedImage >, itk::ImageGaussianModelEstimator< TInputImage, TMembershipFunction, TTrainingImage >, itk::ImageKmeansModelEstimator< TInputImage, TMembershipFunction >, itk::ImageModelEstimatorBase< TInputImage, TMembershipFunction >, itk::LevelSetNeighborhoodExtractor< TLevelSet >, itk::LevelSetVelocityNeighborhoodExtractor< TLevelSet, TAuxValue, VAuxDimension >, itk::MetaArrayReader, itk::MetaArrayWriter, itk::Statistics::BackPropagationLayer< TMeasurementVector, TTargetVector >, itk::Statistics::BatchSupervisedTrainingFunction< TSample, TTargetVector, ScalarType >, itk::Statistics::CompletelyConnectedWeightSet< TMeasurementVector, TTargetVector >, itk::Statistics::ErrorBackPropagationLearningFunctionBase< LayerType, TTargetVector >, itk::Statistics::ErrorBackPropagationLearningWithMomentum< LayerType, TTargetVector >, itk::Statistics::IterativeSupervisedTrainingFunction< TSample, TTargetVector, ScalarType >, itk::Statistics::LayerBase< TMeasurementVector, TTargetVector >, itk::Statistics::LearningFunctionBase< LayerType, TTargetVector >, itk::Statistics::QuickPropLearningRule< LayerType, TTargetVector >, itk::Statistics::RBFBackPropagationLearningFunction< LayerType, TTargetVector >, itk::Statistics::RBFLayer< TMeasurementVector, TTargetVector >, itk::Statistics::TrainingFunctionBase< TSample, TTargetVector, ScalarType >, itk::Statistics::WeightSetBase< TMeasurementVector, TTargetVector >, itk::Statistics::SampleClassifier< TSample >, itk::Statistics::SampleClassifierWithMask< TSample, TMaskSample >, and itk::Statistics::LearningFunctionBase< LayerType::LayerInterfaceType, TTargetVector >. 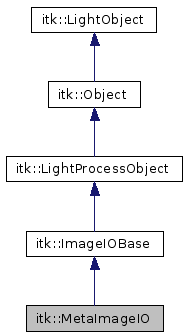 Definition at line 78 of file itkLightProcessObject.h. Definition at line 44 of file itkMetaImageIO.h. Definition at line 42 of file itkMetaImageIO.h. Definition at line 259 of file itkImageIOBase.h. Definition at line 43 of file itkMetaImageIO.h. Enums used to specify byte order; whether Big Endian or Little Endian. Some subclasses use this, some ignore it. Definition at line 211 of file itkImageIOBase.h. Enums used to specify write style: whether binary or ASCII. Some subclasses use this, some ignore it. Definition at line 207 of file itkImageIOBase.h. Enums used to manipulate the component type. The component type refers to the actual storage class associated with either a SCALAR pixel type or elements of a compound pixel. Definition at line 91 of file itkImageIOBase.h. Enums used to manipulate the pixel type. The pixel type provides context for automatic data conversions (for instance, RGB to SCALAR, VECTOR to SCALAR). Definition at line 83 of file itkImageIOBase.h. Insert an extension to the list of supported extensions for reading. Insert an extension to the list of supported extensions for writing. Determine the file type. Returns true if this ImageIO can read the file specified. Determine if the ImageIO can stream reading from this file. Default is false. Definition at line 110 of file itkMetaImageIO.h. Determine if the ImageIO can stream writing to this file. Default is false. Definition at line 117 of file itkMetaImageIO.h. Determine the file type. Returns true if this ImageIO can write the file specified. Calculates the different strides (distance from one thing to the next). Upon return, strides = bytes to get to the next component of a pixel, strides = bytes to get to the next pixel in x direction, strides = bytes to get to the next row in y direction, strides = bytes to get to the next slice in z direction, etc. Convenience method returns the ByteOrder as a string. This can be used for writing output files. Compute the size (in bytes) of the components of a pixel. For example, and RGB pixel of unsigned char would have a component size of 1 byte. This method can be invoked only after the component type is set. Convenient method for accessing number of bytes to get to the next pixel component. Returns m_Strides. Convenience method returns the IOComponentType as a string. This can be used for writing output files. Definition at line 105 of file itkImageIOBase.h. Definition at line 131 of file itkImageIOBase.h. Convenience method returns the FileType as a string. This can be used for writing output files. Return the number of bytes in the image. Return the number of pixels times the number of components in the image. Return the number of pixels in the image. Definition at line 112 of file itkImageIOBase.h. Compute the size (in bytes) of the pixel. For example, and RGB pixel of unsigned char would have size 3 bytes. Convenience method returns the IOPixelType as a string. This can be used for writing output files. Convenient method for accessing the number of bytes to get to the next row. Returns m_Strides. Convenient method for accessing the number of bytes to get to the next slice. Returns m_Strides. Definition at line 121 of file itkImageIOBase.h. This method returns an array with the list of filename extensions supported for reading by this ImageIO class. This is intended to facilitate GUI and application level integration. This method returns an array with the list of filename extensions supported for writing by this ImageIO class. This is intended to facilitate GUI and application level integration. These methods indicate the byte ordering of the file you are trying to read in. These methods will then either swap or not swap the bytes depending on the byte ordering of the machine it is being run on. For example, reading in a BigEndian file on a BigEndian machine will result in no swapping. Trying to read the same file on a LittleEndian machine will result in swapping. Note: most UNIX machines are BigEndian while PC's and VAX's are LittleEndian. So if the file you are reading in was generated on a VAX or PC, SetByteOrderToLittleEndian() otherwise SetByteOrderToBigEndian(). Some ImageIOBase subclasses ignore these methods. These methods control whether the file is written binary or ASCII. Many file formats (i.e., subclasses) ignore this flag. Set/Get the component type of the image. This is always a native type. Set/Get the type of the pixel. The PixelTypes provides context to the IO mechanisms for data conversions. PixelTypes can be SCALAR, RGB, RGBA, VECTOR, COVARIANTVECTOR, POINT, INDEX. If the PIXELTYPE is SCALAR, then the NumberOfComponents should be 1. Anyother of PIXELTYPE will have more than one component. Reads the data from disk into the memory buffer provided. Convenient method to read a buffer as ASCII text. Convenient method to read a buffer as binary. Return true on success. Set the spacing and dimension information for the set filename. Resize the ImageIOBase object to new dimensions. Definition at line 240 of file itkImageIOBase.h. Definition at line 244 of file itkImageIOBase.h. Set/Get the image dimensions in the x, y, z, etc. directions. GetDimensions() is typically used after reading the data; the SetDimensions() is used prior to writing the data. Set/Get the image direction on an axis-by-axis basis. The SetDirection() method is required when writing the image. Definition at line 96 of file itkMetaImageIO.h. Set/Get the name of the file to be read. Definition at line 217 of file itkImageIOBase.h. Definition at line 221 of file itkImageIOBase.h. Specify the region of the image data to either read or write. The IORegion specifies the part of the image to read or write. Regions are defined with an index and a size vector. These vectors define the start (lower-left corner) and length of the region within the image. Make sure that the IORegion lies within the image. Set/Get the number of components per pixel in the image. This may be set by the reading process. For SCALAR pixel types, NumberOfComponents will be 1. For other pixel types, NumberOfComponents will be greater than or equal to one. Set/Get the number of independent variables (dimensions) in the image being read or written. Note this is not necessarily what is written, rather the IORegion controls that. Set/Get the image origin on a axis-by-axis basis. The SetOrigin() method is required when writing the image. SetPixelTypeInfo is used by writers to convert from an ITK strongly typed pixel to a ImageIO (weaker) typed pixel. This function sets these PixelType, ComponentType, and NumberOfComponents based on RTTI type_info structure passed in. The function returns false if the pixel type is not supported. Set/Get the image spacing on an axis-by-axis basis. The SetSpacing() method is required when writing the image. this is only used when streaming is on. Set/Get a boolean to use the compression or not. Set/Get a boolean to use streaming while reading or not. Set/Get a boolean to use use streaming while writing or not. The different types of ImageIO's can support data of varying dimensionality. For example, some file formats are strictly 2D while others can support 2D, 3D, or even n-D. This method returns true/false as to whether the ImageIO can support the dimension indicated. Definition at line 57 of file itkMetaImageIO.h. Writes the data to disk from the memory buffer provided. Make sure that the IORegions has been set properly. Convenient method to write a buffer as ASCII text. Definition at line 366 of file itkImageIOBase.h. Used internally to keep track of the type of the component. It is set when ComputeStrides() is invoked. Definition at line 363 of file itkImageIOBase.h. The array which stores the number of pixels in the x, y, z directions. Definition at line 396 of file itkImageIOBase.h. The arrays which store the direction cosines of the image. Definition at line 406 of file itkImageIOBase.h. Definition at line 373 of file itkImageIOBase.h. Definition at line 367 of file itkImageIOBase.h. Does the ImageIOBase object have enough info to be of use? Definition at line 370 of file itkImageIOBase.h. The region to read or write. The region contains information about the data within the region to read or write. Definition at line 393 of file itkImageIOBase.h. Stores the number of components per pixel. This will be 1 for grayscale images, 3 for RGBPixel images, and 4 for RGBPixelA images. Definition at line 377 of file itkImageIOBase.h. The number of independent dimensions in the image. Definition at line 380 of file itkImageIOBase.h. The array which stores the origin of the image. Definition at line 403 of file itkImageIOBase.h. Used internally to keep track of the type of the pixel. Definition at line 359 of file itkImageIOBase.h. The array which stores the spacing of pixels in the x, y, z directions. Definition at line 400 of file itkImageIOBase.h. Stores the number of bytes it takes to get to the next 'thing' e.g. component, pixel, row, slice, etc. Definition at line 410 of file itkImageIOBase.h. Should we compress the data? Definition at line 383 of file itkImageIOBase.h. Definition at line 386 of file itkImageIOBase.h. Definition at line 389 of file itkImageIOBase.h.